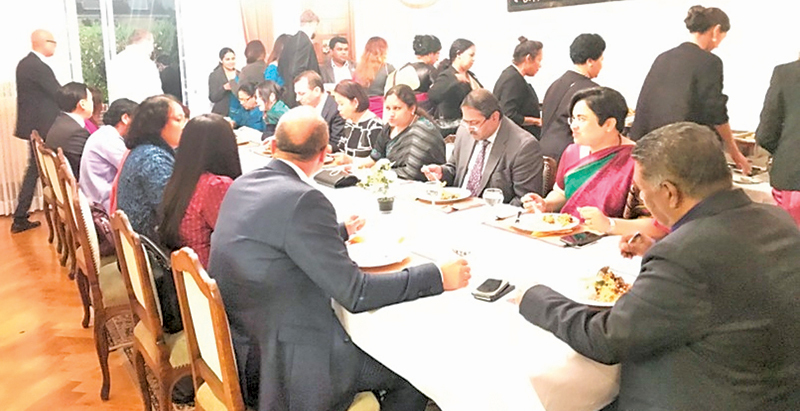 The Sri Lankan Embassy in Berlin organised a Sri Lankan cultural evening at the official residence of the Ambassador recently, inviting Ambassadors of the Asia Pacific Region and the Ambassadors of accredited countries. The event was held to mark the 65th Anniversary of Sri Lanka – Germany diplomatic relations and to further strengthen the relations and promote Sri Lankan culture among friendly countries. Traditional Sri Lankan dances were performed by the ‘Sasanthra dancing troupe’ who visited Berlin to perform at the event. The performances were appreciated for their vibrant nature which highlighted the multiculturalism in Sri Lanka. Ambassador Karunasena Hettiarachchi spoke on the close and friendly ties between Sri Lanka and Germany, and encouraged further strengthening of relations. The programme also aimed at promoting Sri Lanka as a tourist destination in Germany and to build a close rapport with the diplomatic community in Berlin. At the end of the event, invitees were served with Sri Lankan cuisine creating a truly Sri Lankan ambience.